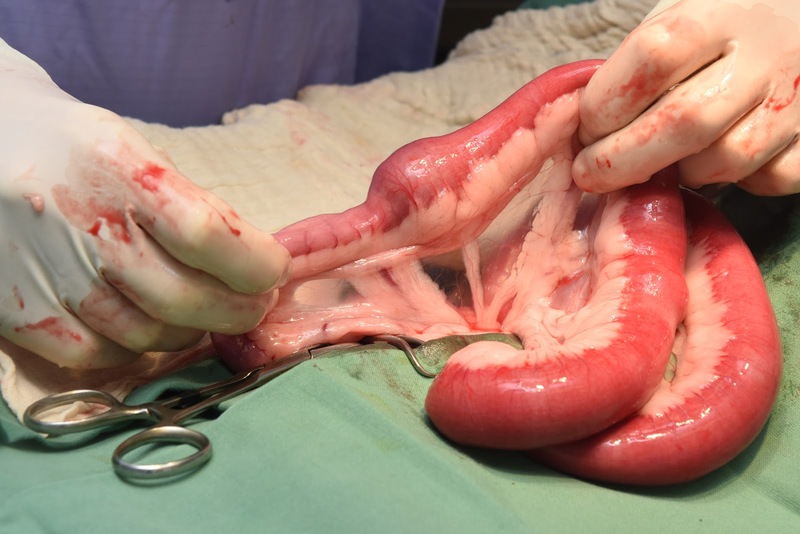 A gastrointestinal foreign body in situ - one of the most common causes of an acute abdomen in the dog. Not so much in human adults. Have you ever wondered if your doctor has had a decent sleep, or a proper and nourishing meal? It was a question I was unexpectedly confronted with last week when a very close human family member was admitted to hospital with an acute abdomen. It became rapidly apparent that this was a surgical condition. Due to a series of unfortunate events, the surgery was delayed. Patient X was meant to be transported to a larger hospital, but this didn’t occur due to the patient transport staff member calling in sick. As most surgeons know, at some critical point, time is bowel. So it was concerning that the surgery – scheduled for the morning – was not going to be addressed until late in the evening, when the on-call surgeon had been working constantly on critical cases and hadn’t had a break, and Patient X had been enduring discomfort for 48 hours. Free abdominal fluid had been detected on ultrasound. To the team’s credit, everything went well. Patient X is recovering (I am so used to veterinary patients that I was shocked that I was able to converse with Patient X on the phone post anaesthesia. I wish our patients could call us and tell us things like “my throat is a bit sore from the ET tube” or “this pain relief is working really well”, or Whatsapp a cheery hospital selfie. It must at least be helpful to be hospitalised in a facility staffed by members of one’s own species). And no, it wasn't a foreign body but an obstruction which occurred secondary to an adhesion which occurred secondary to a previous surgery. (Disappointingly, at least for me, there was no surgical photo). The following day, when the surgical registrar called to update me, he was amused that I asked him if he’d had some sleep. But I was serious. We need to look after our health care professionals. The French vascular surgeon Rene Leriche, in The Philosophy of Surgery, wrote that “The best surgeons are those who are able to maintain their fitness and comfort during the long-lasting jobs” back in 1951. (He also wrote that “Every surgeon carries about him a little cemetery, in which from time to time he goes to pray, a cemetery of bitterness and regret, of which he seeks the reason for certain of his failures” – an important acknowledgement, but somewhat concerning to recall when you know the patient, and you know there is a correlation between hypoglycaemia, hypohydration and errors). I digress. It’s important that doctors are not overworked, are well-supported, take decent breaks, eat nourishing food and get recharging sleep. In an article last week in The Conversation, Professor Alex Broom put it succinctly: “Doctors who feel better will make fewer mistakes and solve problems faster.” (Read the full article here - he also makes the point that stressed doctors are less motivated to participate in continuing education, yet “participation in continuing education improves professional practice, and, crucially, patient outcomes”). The Australian Medical Association lists some excellent resources on its website, many of which are just as relevant to veterinarians and nurses too. You can access those here. We need to look after those people that look after others. In terms of vets, we’re working on The Vet Cook Book which should be published later this year. This is designed to promote collegiality and conversation but also provides some helpful resources – and recipes. You can follow the facebook page. Fortunately, and thanks to excellent care despite many challenges, patient X is doing well, having been discharged home for cage bed rest (without an Elizabethan collar). In other news, an exhibition which opened on June 9 highlights the plight of victims of domestic violence and their companion animals. This looks like an amazing initiative and worth seeing. If you’re in Sydney, SAT reader Kerry shared this info about doggy degustation events (obviously not for the canine on an elimination or prescription diet).